Many Astrologers are practising commercial astrology. Most of them have customarily inherited and kept it as a guarded secret for obvious reasons. This perhaps is the first serious attempt to unfold the niceties of this inadequately discussed subject. 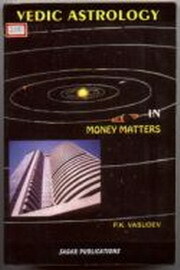 In this book, the author endeavoured to embody such materials which provide comprehensive and cogent information to impart meaningful support to the speculators and investors alike, to help taking timely and prudent decisions to accentuate gains and avert losses. The thrust of the book is to demonstrate the efficacious use of the complex ancient discerning tools like Sarvatobhadra Chakra and others in presaging market tendencies in a simple way. Celestial Phenomenon that command over wide array of terrestrial events including social commercial values have been brought out in a succinct manner. An ardently written prolific work on the whole gamut of business astrology duly blended with other congruous factors to make it a complete yet compact reading material on the subject. Every aspect of it is perfectly synthesised and portrayed in a lucid form.